Designed and manufactured by British firm Trueform, the displays help to drive customer engagement and boost marketing opportunities. Global shopping giant Unibail-Rodamco-Westfield has completed the installation of more than 250 bespoke designed digital display solutions inside its two London-based shopping centres in White City and Stratford. The displays, which include 170 installations in White City (West London) and 80 in Stratford (East London), were designed and built by British company Trueform, who provided an end-to-end-service for the project. Digital signage plays a crucial role in Westfield's recently completed £600 million expansion upgrade of its White City location — a venue which welcomes more than 30 million visitors a year and covers more than 2.6 million square feet. With a desire to improve the customer experience, while also enhancing marketing opportunities, a range of 49in., 55in. and 75in. digital 4G connected 4K displays, each incorporating interactive digital advertising and touch screen functionality, have been installed. The units utilize combinations of both Samsung and LG open frame displays with Trueform’s own ‘Fusion’ smart technology climate control engines, which feature remote diagnostic and repair capabilities, utilizing Broadsign on Windows 10-IOT platform. With the success of the White City installations, Trueform has since provided a further 80, 75in. digital pods at its Stratford, London location. 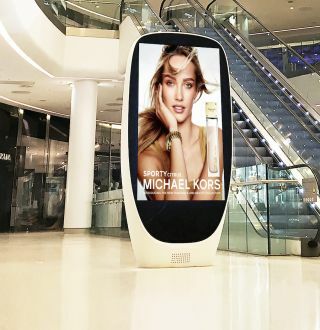 All pods can provide internet connectivity, audience measurement and analytics and are visible in all lighting condition, including direct sunlight. Built from long-lasting rugged materials they are able to withstand potential vandalism attacks.